Twice now, in the span of as many months, I have been bowled over by a book. The first was John Williams’ Stoner, and the latest is Frederick Exley’s novel-memoir A Fan’s Notes. The two works are united in their obscurity, so to speak – they remain grossly under-appreciated – and in their subject matter: a man assailed by forces larger than himself, struggling to stand tall. But the titular character of John Williams’ book is beset from the outside, whereas Frederick Exley is doomed to be his own antagonist. In a prefatory note, he asks to be judged “as a writer of fantasy,” despite some glaring biographical influence: “Though the events in this book bear similarity to those of that long malaise, my life, many of the characters and happenings are creations solely of the imagination.” Alexander Pope, in his “Epistle to Dr. Arbuthnot,” likewise spoke of “this long disease, my life,” in a passage that begins “Why did I write? what sin to me unknown / Dipp’d me in ink, my parents’, or my own?” and the connection is undoubtedly intentional, our first indication that Exley is a man of high writerly ambitions. In fact, one way to sum up this novel’s plot would be to describe it as a recounting of history’s worst case of writer’s block. We first meet Exley when he is 32 years old, working, during the week, as a school teacher in Glacial Falls, New York – “a rural community of ten thousand, buried half the year under leaden skies and heavy snows, and all the year under the weight of its large and intransigent ignorance” – and spending his weekends on “heroic” drinking binges in his hometown of Watertown, where he spends every Sunday nursing a hangover and cheering on the New York Giants with the kind of gusto only a profoundly lonely man can muster. His routine is halted by a heart attack, or rather, what he perceives to be a heart attack, but is in fact a series of heart palpitations brought on by excessive drinking. The pain was excruciatingly vivid, and for many moments I was terrified by the fear of death. Illogically, this was one terror I believed I had long since cast off – having cast it off, I thought, with the effortless lunacy of a man putting a shotgun into his mouth and ridding himself of the back of his skull. That the fear of death still owns me is, in its way, a beginning. The proverbial rock bottom, and we are still only on the first page. Exley has a kind of epiphany, occasioned by his bartender’s refusal to believe that he has any children of his own, and a mocking impression he does of Exley, ten years hence, still cheering for his Giants, still drinking to excess, and still insisting that the faded photograph represents his children. With a kind of omniscient clarity I suddenly recognized the truth of this vision. I saw myself some years hence, drunk, waiting “for the game,” without self-denial, without perseverance, without hope. In this vision there was nothing but dark rooms from which love and grace and charm were fled, and indeed – how very acute Freddy was! – all I had to cling to, yellowing now with age, was this fading photo of my twin sons, my only and final link with humanity, and one, at that, which people neither believed in nor really cared about. But rather than propel us forward in time, to a better future free from drink and football, Exley takes us back in time, in a series of episodes that fill in his background and help us to understand how he arrived at his present, fallen state. We learn, for example, that his father died at 40, the victim of an undiagnosed heart condition, and that he was something of a hero in Watertown, having acquired a “nostalgic eminence” thanks in part to his athletic prowess and in part to his personality. “The tales men selected to pass on about him were never so much about a ninety-yard run as about an authentically colorful man having a ball and in an amiable way thumbing his nose at life.” But the tales that Exley chooses to relate to us inevitably connect, in some way, to sports: his father playing football to an adoring crowd; his father competing against him – beating him, in fact – in a father-son basketball game; and his father using his renown to take a group of the town children into the local football games. He never – or it seems to me now – paid to go anyplace. Doors opened before his growing legend, and through the one into the high school games he took not only himself and me but every scrawny-kneed, matty-haired, nose-running, jug-eared, obscenity-prone kid in town, boys orphaned by a depression that had left them without the price of their dignity. Other men might inherit from their fathers a head for figures, a gold pocket watch all encrusted with the oxidized green of age, or an eternally astonished expression; from mine I acquired this need to have my name whispered in reverential tones. […] I wanted the wealth and the power that fame would bring; and finally, I wanted love – or said that I did, though I know now that what I wanted was the adulation of the crowd, and that love was just a word that crowded so many other, more appropriate words off the tongue. Woe to him who confuses fame with love, public acclaim for private esteem. If I have thus far described this book as a tragedy, I have obscured how very funny it is, and the degree to which Exley can find – in his most shameful failures – a redeeming laughter. As a recent college graduate, for example, testing his luck in New York City, he dresses and grooms himself like his literary hero du jour, Truman Capote (effeminate chic with a side-part, in case you can’t conjure an image), places a Yello-Bole pipe between his teeth (for an added “ruminative air”), and walks into every interview as if his time is being imposed upon. If I was kept waiting beyond a carefully scrutinized five minutes, there was no interview! Rising from my chair and ambling over to the man’s secretary, I would bow ever so slightly, the very image of genteel breeding; then suddenly, bringing myself up to a dictatorially rigid posture, I would proclaim, my tone controlled but testy: “I’m sorry, young lady, but will you tell your employer that Mr. Exley had other commitments and couldn’t wait. If he wishes to set up another appointment and begin it at the – ah – designated time” – I would be looking at my empty wrist as though it contained a hundred-jewel job – “then he knows where to reach me.” Clicking my heels slightly and smiling my distant smile, I would depart, saying, “Adieu, my dear, adieu,” terribly certain that I had rendered the girl sexually tractable. These repeaters were the ugly, the broken, the carrion. They had crossed eyes and bug eyes and cavernous eyes. They had club feet or twisted limbs or – sometimes – no limbs. These people were grotesques. On noticing this, I thought I understood: there was in mid-century America no place for them. America was drunk on physical comeliness. America was on a diet. America did its exercises. America, indeed, brought a spirituality to its dedication to pink-cheeked, straight-legged, clear-eyed, health-exuding attractiveness – a fierce, strident dedication. […] One didn’t know whether these people had been rendered grotesque by their perverseness or whether their grotesqueness had rendered them perverse. Still, I saw the comfort America could purchase itself by getting rid of them. There is no room in America for these repeaters, and there is no room in America for Exley. In a later episode, when he simply confines himself to a bed in his step-father’s home, he romanticizes his inertia: “In a land where movement is virtue, where the echo of heels clacking rapidly on pavement is inordinately blest, it is a grand, defiant, and edifying gesture to lie down for six months.” Perhaps. But it does not alleviate his suffering, or help him to transcend it, for with every episode he relates, we readers know he is getting one step closer to another confinement, another alcoholic collapse. In a moment I would fall asleep. But before I did, all the dread and the dismay and the foreboding I had been experiencing disappeared, were abruptly gone, and I felt quiet. They disappeared because, as I say, I understood the last and most important reason why I fought. The knowledge caused me to weep very quietly, numbly, caused me to weep because in my heart I knew I had always understood this last and most distressing reason, which rendered the grief I had caused myself and others all for naught. I fought because I understood, and could not bear to understand, that it was my destiny – unlike that of my father, whose fate it was to hear the roar of the crowd – to sit in the stands with most men and acclaim others. It was my fate, my destiny, my end, to be a fan. 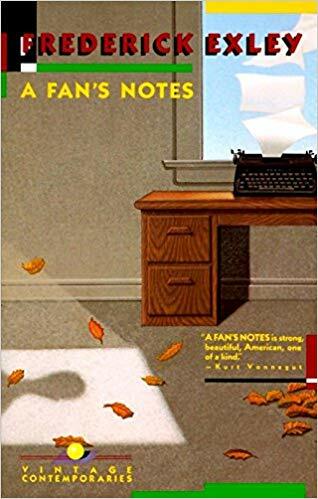 Hence the title, A Fan’s Notes, and that self-deprecating word “notes,” which describes something prefatory to a novel, but not the novel itself. Is that what we hold in our hands, as we turn the final page, not a writer’s novel but a fan’s notes? In his 63 years, Exley managed to write only three novels. An obituary in the Chicago Tribune was unsparing: “He remained a drunk and a layabout, and even before he died of a stroke on June 17, 1992, he had been largely forgotten along with his work.” We might be tempted to accede to his own estimation, to credit fate with dooming him to the bleachers. And yet every Exley reader holds in her or her hand his raucous rebuttal to fate, his triumph over destiny – and one of the finest novels I’ve ever read.